In this tutorial, I will show you a quick guide to convert a custom website designed by using bootstrap into android application. Converting a custom website into android app is very easy. If you have the good knowledge about web design then you can easily convert that webpage into android app. 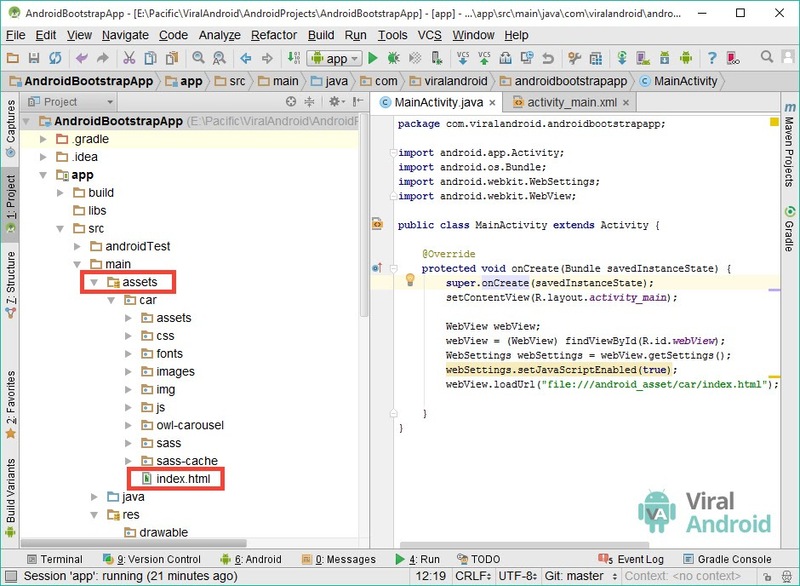 In this tutorial, I have used android studio as coding environment. If you already have your own custom bootstrap website, you can use that, If you don’t have then you can download bootstrap website from here which I have used in this tutorial. After completion of download unzip car file and place it in your folder. Let’s start by creating a new android project to convert custom bootstrap website into android application with following information. To add website file, first you have to create assets folder in your app/src/main directory and copy and paste your custom bootstrap website or website that you downloaded in assets folder. Look at below screenshot. You have done all things. Now, run your application by just clicking run button then you see your website as android app. Congratulation! you have made your android app using bootstrap. Download complete Building Android App using Bootstrap example project source code from GitHub.